The event was co-organised by the HCM City Union of Friendship Organisations (HUFO) and the Vietnam Buddhist Sangha (VBS)’s HCM City chapter. 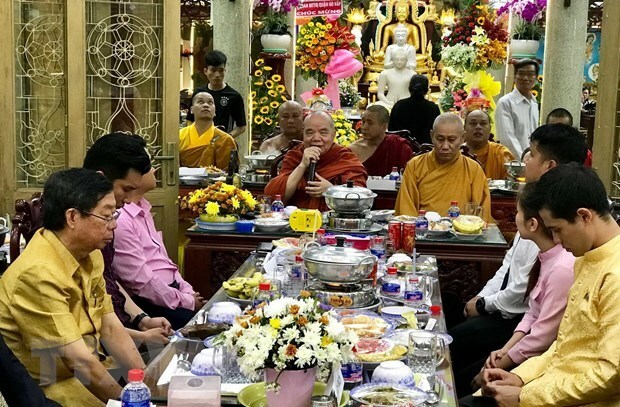 It was attended by Most Venerable Thich Thien Tam, Vice President of the VBS’s Executive Council and deputy head of the VBS’s HCM City chapter; representatives of Consulates General of Cambodia, Laos, and Thailand; and people from these countries who are living in the southern city. Addressing the event, HUFO Vice President and General Secretary Nguyen Van Manh said the celebration is hoped to bolster mutual understanding between Vietnam and neighbouring countries, bringing practical benefits for national building and development of each nation. He stressed that Vietnam, Cambodia, Laos, Myanmar, and Thailand have enhanced cooperation over the years as close neighbours in the ASEAN Community. People from these countries have helped each other during their struggles for national independence in the past and national construction and development at present, towards building an ASEAN Community of peace, stability, cooperation, and prosperity. Luon Bunvadh, a representative of the Cambodian Consulate General in HCM City, said the event offers a chance for people of participating countries to strengthen solidarity, adding that Cambodia, Laos, Myanmar, Thailand, and Vietnam share various cultural similarities.